The MOST URGENT injuries are chemical burns and open globe injuries. These usually require immediate consultation with an ophthalmologist. All other injuries should be followed-up with an ophthalmologist, preferably within 24 h.
That’s everything you should know about the eye in 60 seconds or less! Read below for further information and discussion on specific issues! Sx: severe pain, lacrimation, photophobia, blepharospasm. Visual acuity may be normal or slightly lower. Usually heal completely within 1-2 days with treatment and follow up monitoring. Diagnose: Apply topical anesthetic drop if patient cannot open eye without pain. 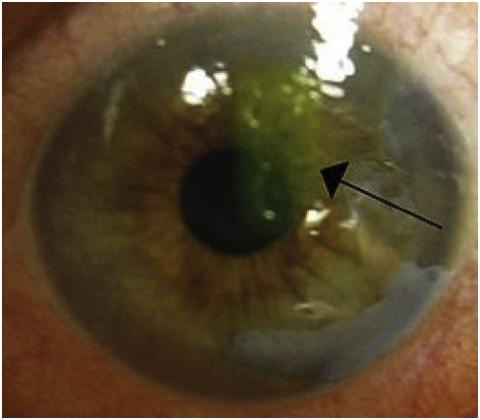 Instill fluorescein dye into conjunctival sac to view areas of corneal abrasion (the areas of abrasion will glow green under a Cobalt blue light). Look for signs of infection (white infiltrate) in the wound. Tx: Clean out any debris with ophthalmic irrigating solution. Apply broad-spectrum antibiotic (especially for contact lens wearers and injuries caused by “dirty” external agent, such as a tree branch or fingernail) and advise patient to take oral analgesics if required. Do not apply an eye patch on contact lens wearers or patients who had a dirty injury because this may increase risk of infection. The outcome of chemical trauma to the eye will depend on how quickly the chemical is washed out of the eye. The first thing to do is IRRIGATE with several liters of saline per eye (check under lids), using a Morgan lens. Continue irrigation until a pH paper test on the eyeball comes out neutral. Exam- An inflamed red conjunctiva is a good sign, whereas white conjunctiva may mean serious damage to the conjunctival blood vessels. Consult an ophthalmologist as soon as possible to determine the extent of injury. Image courtesy: Yousem, David. “Orbital Pathology.” The Radiology Assistant. N.p., 19 Sept. 2008. Web. Sx: Damage is usually visible anteriorly because ruptures tend to occur on thinnest part of sclera. Diagnose: IntraOcular Pressure (IOP) will be lower and anterior chamber will appear to be shallower than the opposite eye. Pupil may appear irregularly shaped. Do the Seidel test: apply fluorescein dye strip and visualize with Cobalt blue light. If the dye dilutes to a pale color or flows down the surface of the eye, that may be due to aqueous fluid leakage indicating an open globe wound. CT imaging also often shows evidence of globe rupture. If rupture is suspected but not confirmed, consult an ophthalmologist for further investigation of the injury. Tx: This is an ophthalmologic emergency that requires you to consult a specialist! Do not apply pressure to the eye, and place a rigid eye shield if necessary. The current standard of care is also to administer prophylactic systemic antibiotics to prevent endophthalmitis from such organisms as streptococci, staphylococci and bacilli. Elevating the head of the bed and prescribing anti-emetics and analgesics also make the patient more comfortable. Sx: Orbital floor and medial wall are especially susceptible to breakage from blunt force trauma to the eye. Orbital and periorbital swelling and ecchymosis will be apparent. Patient may also have diplopia resulting from entrapped muscles (especially inferior rectus and inferior oblique muscles). Diagnose: Examine vision to ensure the optic nerve is not affected. Extraocular movement: will be reduced but there should be no sign of muscle entrapment by broken bone. Proptosis or Enophthalmos: is the eye bulging out or is it sunken in? Palpate: to check whether the orbital rim is fractured or whether there is crepitus (subcutaneous emphysema is rare but possible due to trauma). Tx: Outcomes are good for patients who have no damage to the globe of the eye, even without surgical intervention. Prescribe an antibiotic, a nasal decongestant spray and tell the patient to avoid blowing his/her nose. If other damage to the eye exists (eg. enophthalmos, diplopia, retinal detachment, etc) then an ophthalmologist must be immediately consulted. Rust ring Image courtesy: Wilson, Stephen A., and Allen Last. “Management of Corneal Abrasions.” Am Fam Physician 70.1 (2004): 123-28. Sx: These are difficult to evaluate in the ER and are suspected based on the type of injury (explosion, broken glass fragments, use of power tools, motor vehicle collisions, etc). Foreign objects can be superficially embedded, or located within the eye. Superficial objects will cause pain, blurry vision and sensation of a foreign body in the eye, though they can also be asymptomatic. Deeply located objects may be very difficult to find, especially if the patient has no initial symptoms. 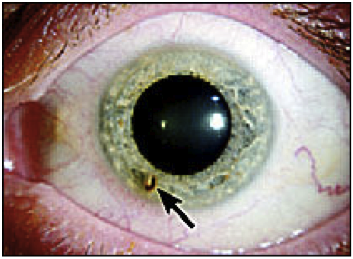 Diagnose: determine the location and type of foreign body in the eye. A CT scan may be indicated to look for objects inside the eye, but an MRI should be avoided if the fragments could be metal. Tx: Look for signs of open globe injury: if seen, consult ophthalmologist immediately. Superficially located debris, such as rust rings from iron-containing foreign objects, can be removed using an ophthalmic burr or 18 gauge needle to dislodge the object. If it is too deep or difficult to remove, refer the patient to a specialist immediately. Provide a tetanus booster if necessary. Image courtesy: “Blunt Injury: Hyphema.” The Eyes Have It: Ophthalmic Trauma. American Academy of Ophthalmology, n.d. Web. Sx: Blood floating in the anterior chamber of the eye, ranging from a few red cells to blood filling the whole chamber. Photophobia, pain and blurred vision may also result. Diagnose: Check IOP, which may be elevated due to damage to the anterior chamber angle (UNLESS globe rupture is suspected, in which case no pressure should be applied). Check for absent red reflection of the pupil. Document the height of the fluid level of the blood in the eye in order to assess whether bleeding has worsened later on. Tx: Give steroids to reduce inflammation and a cycloplegic dilator to decrease photophobia, and also to prevent the iris from sticking to the lens. Elevate the head of the patient’s bed 30 to 40° to allow blood to settle. Refer patient to ophthalmologist for daily follow-up until blood clears. 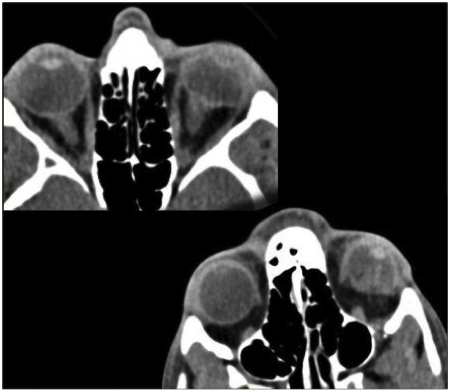 Image courtesy: Setnik, Gary S. “Nerve Blocks of the Face.” Ed. Todd W. Thomsen. Procedures Consult. Elsevier, n.d. Web. Determine how close the laceration is to the canalicular system of the eye (medial), as these kinds of injuries are more difficult to repair, and will require an ophthalmologist to insert a tube to keep the tear drain open. A deep lid laceration could also be suspicious for open-globe injury. 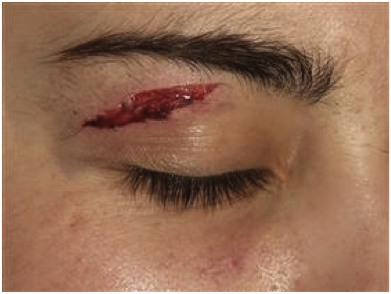 If the laceration is superficial and not at the lid margins, skin sutures can be done in the ED. If the laceration involve the lid margins but is not near the nose, it can still be repaired by taking special care to line up the lid margins and keep the eyelashes in the correct orientation. Any complicated case should be referred to an ophthalmologist. Nichols, Bruce D. “Ocular Trauma: Emergency Care and Management.” Can. Fam. Physician 32 (1986): 1466-471. Pokhrel, Prabhat K., and Sanaz A. Loftus. 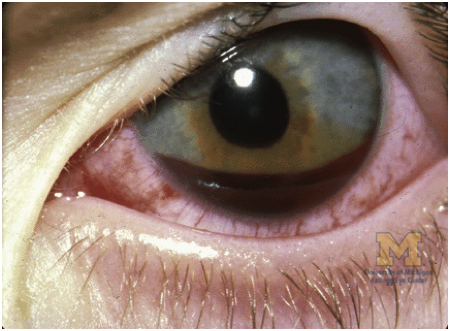 “Ocular Emergencies.” Am Fam Physician 76.6 (2007): 829-36.